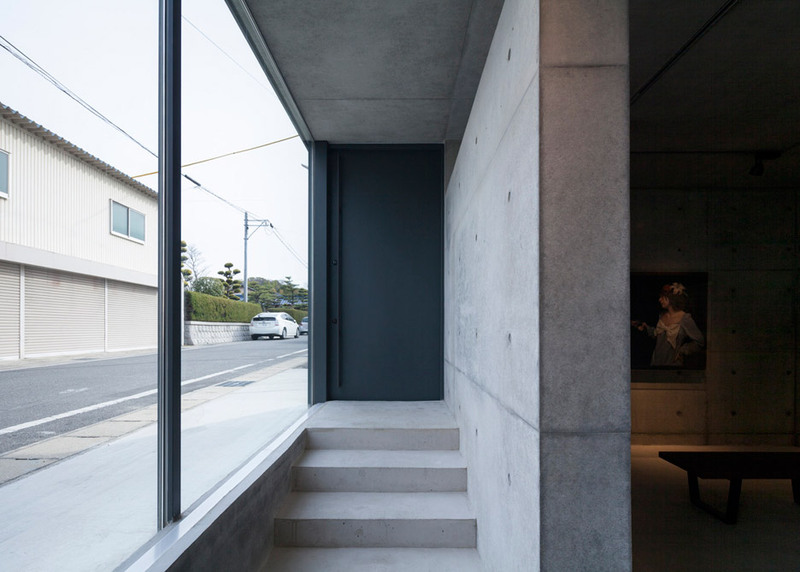 The interior design of a small house Apollo CompanyArchitects & Assosiates completed the construction of the highest building of the Japanese Aichi Prefecture, which has both an art gallery and rooms for a comfortable family holiday. 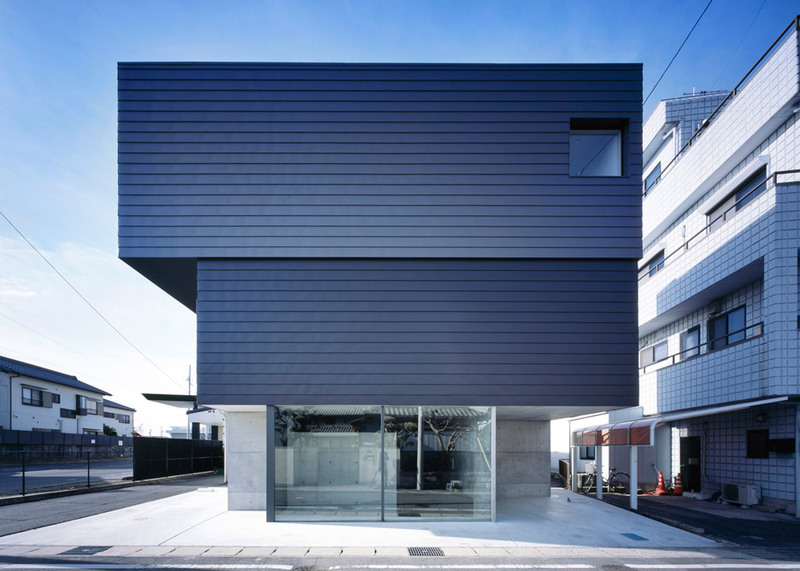 Gaze successfully combines in its walls comfortableaccommodation and modern art The three-story building, called Gaze, is located in Obu, south of Nagoya. 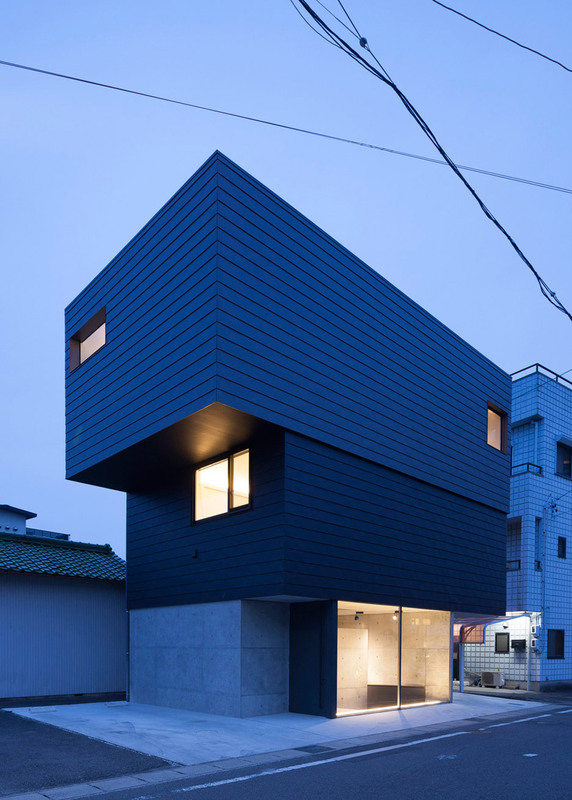 The Japanese company has designed the design in such a way that, as a result, a small gallery of modern art is located on the lower level and two floors of living space are higher. 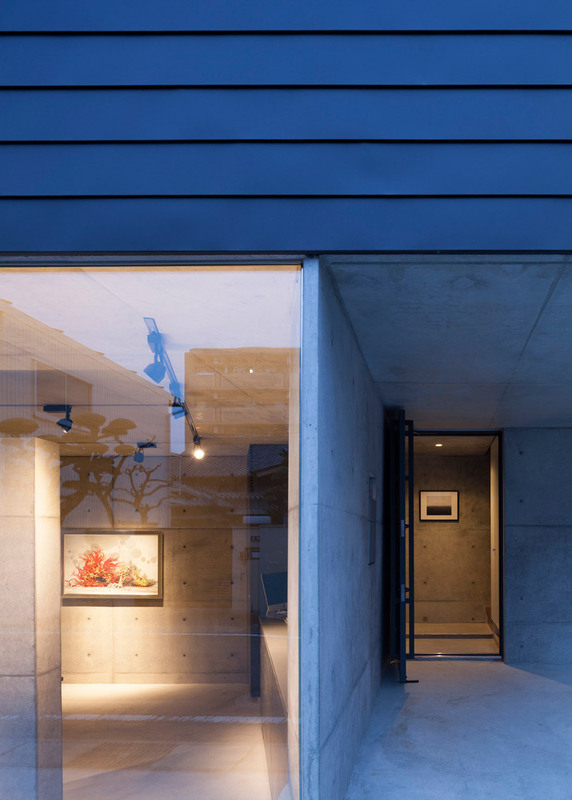 On the ground floor of the building - gallery On requestThe customer who plans to expand the gallery area soon, Satoshi Kurosaki, head of Apollo, has created a number of premises with the most flexible layout. Externally, the building area of ​​125 square meters. m. looks like a stack of three boxes. Below - a small glass framed in concrete structures, on top - two large metal one on another. 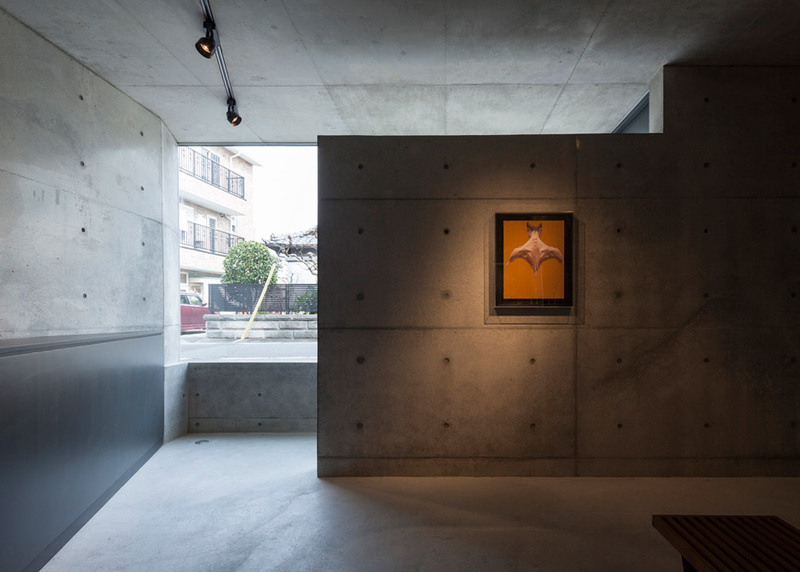 The structure is like three boxes stacked on top of each other.“In this structure, various structures are organically connected: a podium made of reinforced concrete and glass on the first level, and two floors similar to wooden boxes - above,” explains Kurosaki. “The total area of ​​the building becomes larger as its height increases,” he adds. 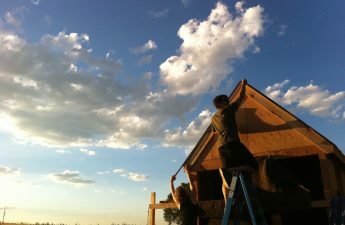 This technique is becoming increasingly popular among architects who are trying to achieve increased space in small areas. To achieve this, the Gaze designers used a combination of concrete and wood, combining several consoles. To create the effect of dark metal, the blocks of the two upper levels are lined with Galvalume material. This is a steel sheet coated with aluminum-zinc alloy. With this, the designers achieved a contrast of the upper blocks with transparent glass and untreated concrete of the lower level. The architects managed to achieve a contrast betweenLevels The concrete walls, ceiling, and floor of the gallery have not been finished. 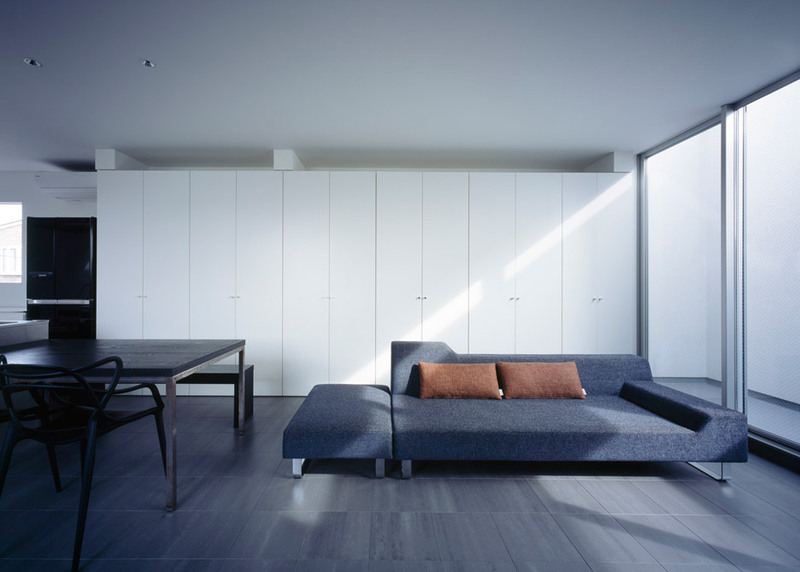 The interior decoration of the building is simple and uncomplicated, especially in the freely planned living room on the upper floor, in which the white walls are adjacent to the dark tiled floor. The inner surfaces of the gallery were not finished. 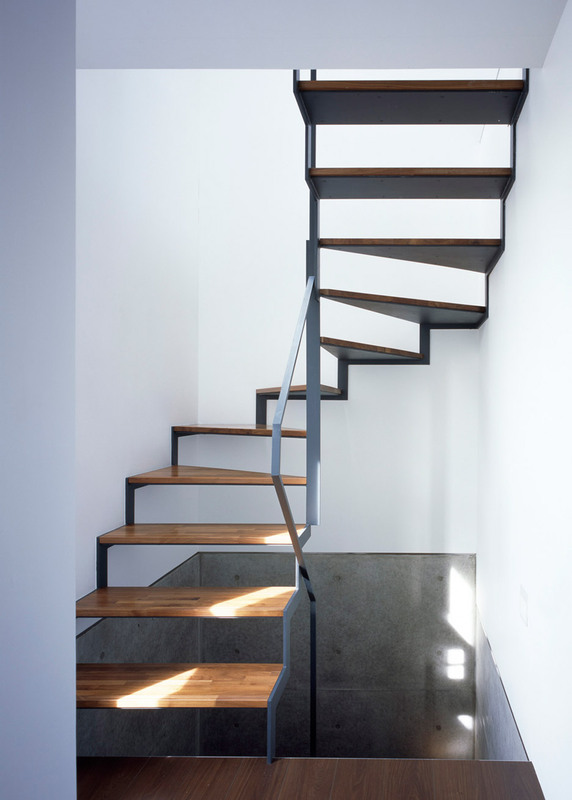 The steel staircase with wooden steps of warm colors is one of the few color accents of the building. The staircase is one of the accents of Gaze.the decoration and furniture of the family rooms are intentionally made with the utmost simplicity in uniform colors. 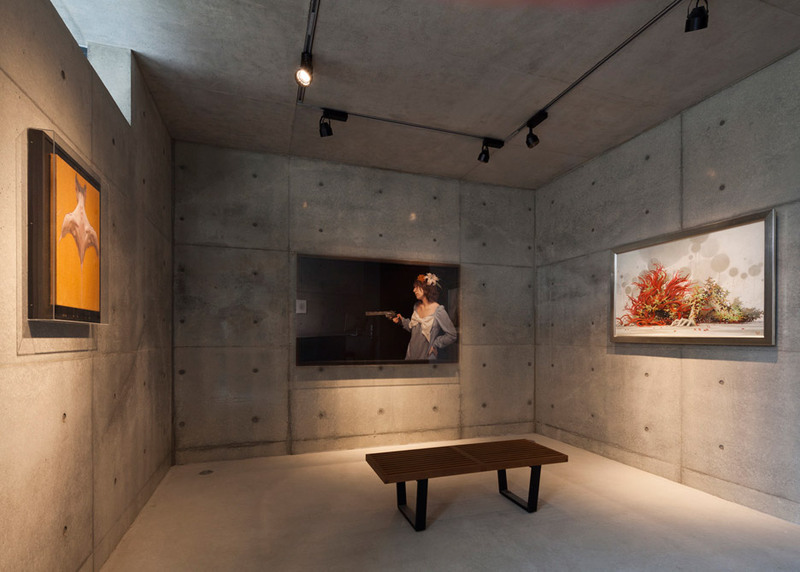 In the future, this will allow to convert these rooms from the living space to the gallery premises where the customer’s collections will be exhibited, ”added Kurosaki. The interior of the apartment is extremely simplethere will be a viewing room. You can live side by side with art, without losing the feeling of solitude, ”adds the architect. The open-plan living area occupies the entire upper floor. 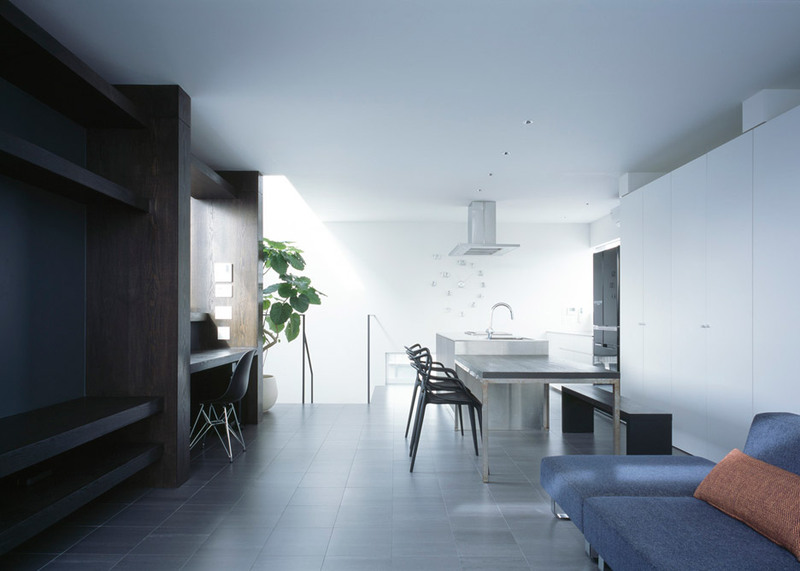 The kitchen and dining table interconnected are located in one side of the room, and the seating area opens onto the isolated balcony of the other. The open-plan living area is located on the upper level. Three bedrooms are located on the middle floor, along with a bathroom, toilet and washroom. 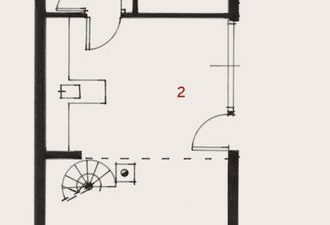 On the second floor of the building - bedrooms In order toto combine in the building the functions of the gallery and the living space; there is a second entrance leading directly to the upper floors. 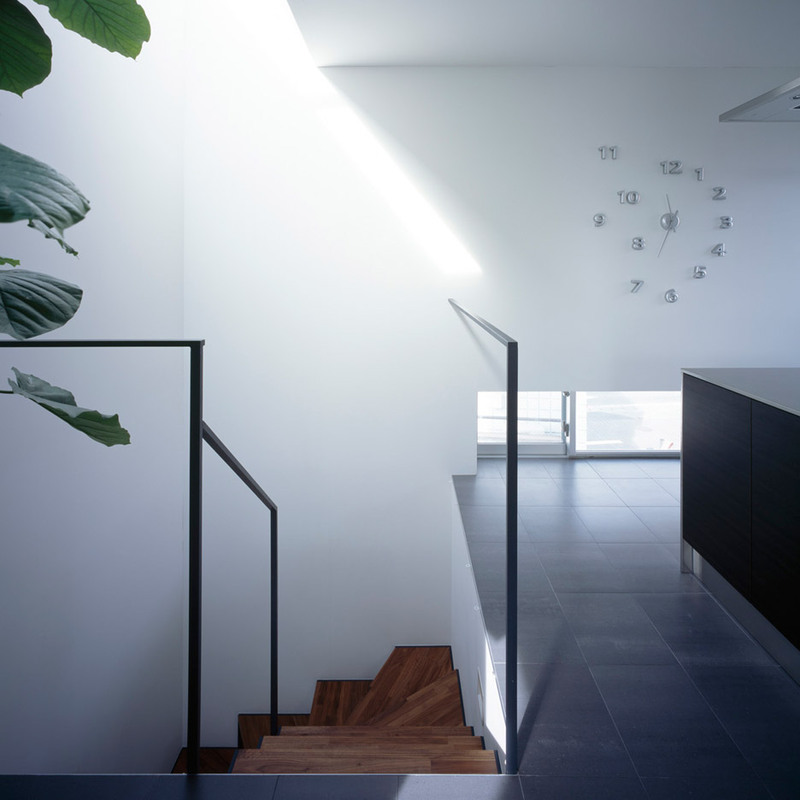 Skylights provide excellent illumination of the living area, which, according to Kurosaki, creates a "pleasant atmosphere." 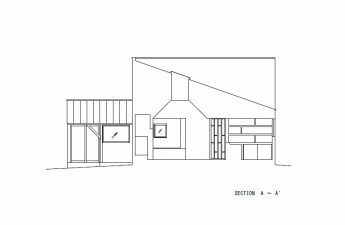 To get directly into the living quarters, you canuse the second entry Kurosaki created Apollo Architects & Assosiates in 2000. The company currently has subsidiaries in Japan, China and South Korea. 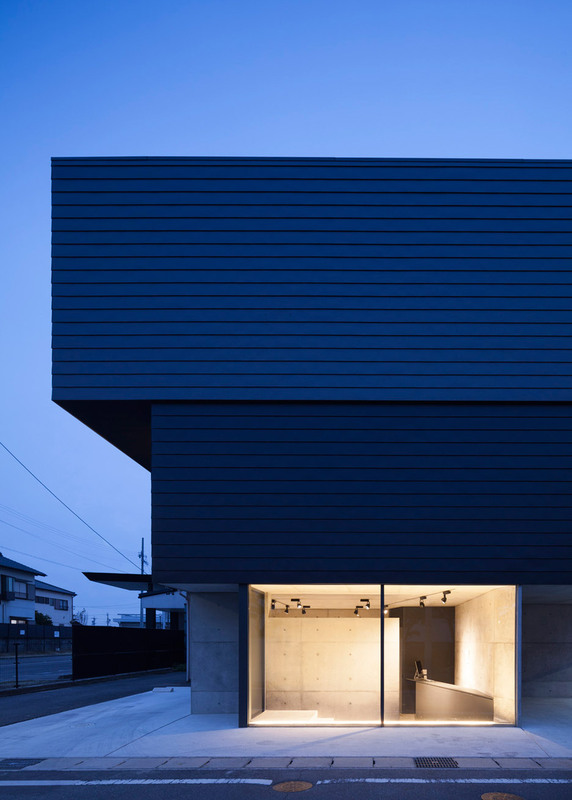 Among other projects of the architect is the house, which is called Noah's Ark and the house-studio for a fashion photographer. If you are close to the idea of ​​combining rooms created for very different purposes, tell your friends about this article!